There are a lot of reasons why investing in a high-quality air mattress is a good idea. 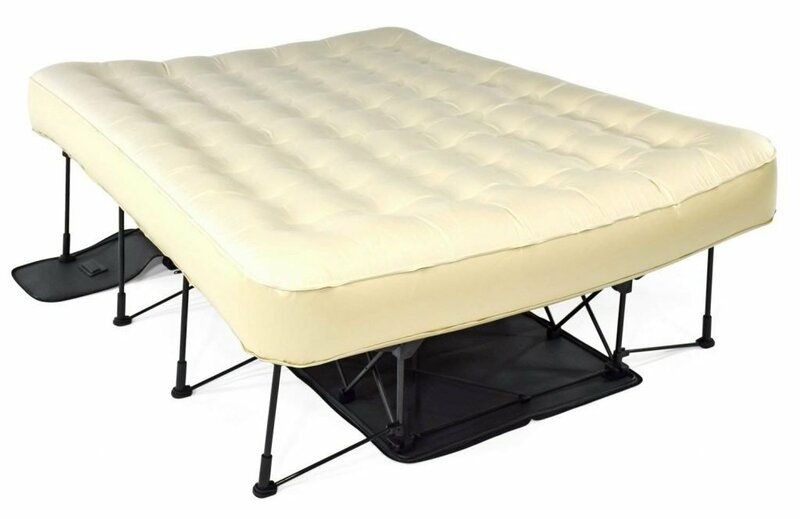 Unlike a futon or cot, an air mattress provides the same amount of space as a regular mattress plus it deflates and is easily stored when not needed. 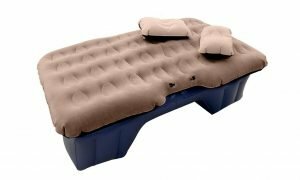 Whether you’re waiting for furniture delivery, want to sleep more soundly when camping, or need something to accommodate overnight guests, the best air mattress is a comfortable solution in an easy to store package. We considered some of the most important features to put together this review. The first thing you have to decide is how and where you plan to use your air mattress. We included a nice variety of options to suit any occasion. 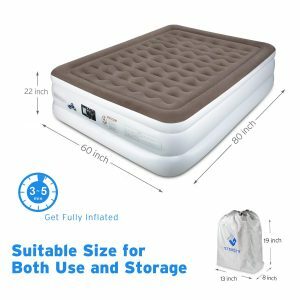 Size is important, too, especially if you’re looking for the best king size air mattress to accommodate two sleepers comfortably. We not only looked at the pump but how quickly it inflates and whether or not you can choose different firmness levels. Weight is important, too, especially if you’re looking for something portable. Finally, we considered durability to make sure your mattress will last and warranty to make sure you’re covered if it doesn’t. To put together our list of the best air mattresses, we spent hours researching information from manufacturers as well as comments from experts and people just like you who use these products every day. The first thing you’ll find is a table where you can see all of our options in one place to quickly and easily compare. After that are in-depth reviews of each product followed by a detailed buying guide to help you find the best air mattress for you. 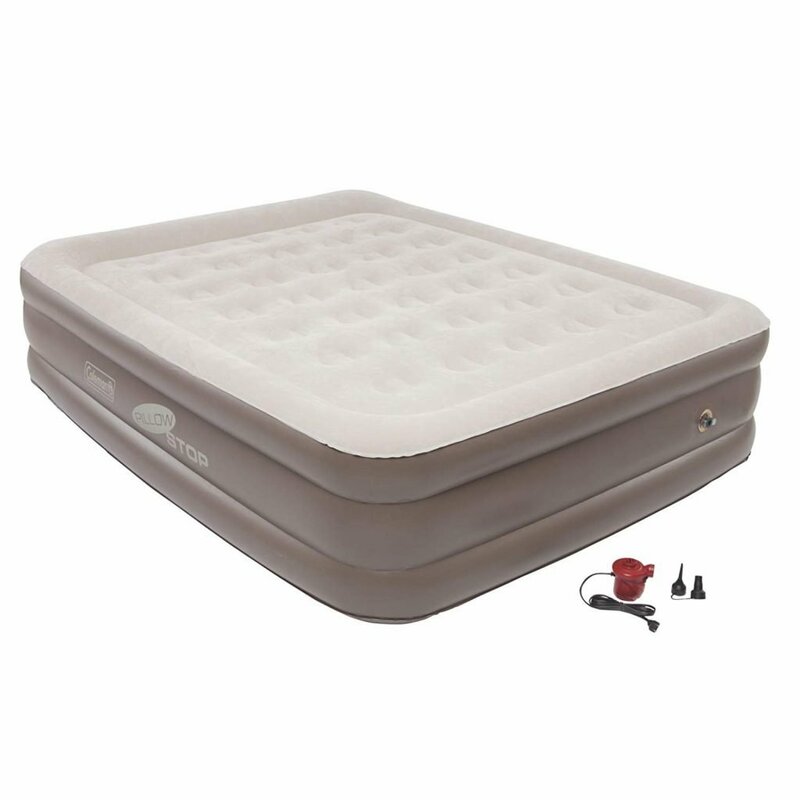 The SoundAsleep Dream Series Air Mattress is an ideal option that’s convenient, durable, and large enough to sleep two people comfortably. It features a double-height, dual chamber construction with a Sure-Grip bottom that prevents it from sliding around when getting in and out of bed. One of the things that make this mattress so comfortable is the 40 internal air coils which add extra support. 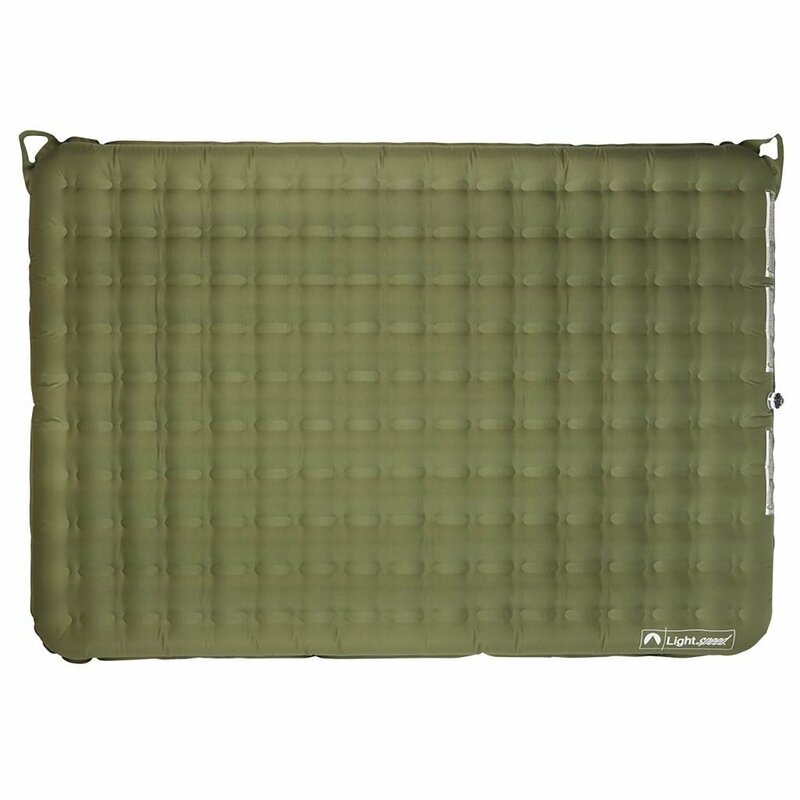 There’s also an extra-thick waterproof flocked top and multilayer puncture resistant material for added durability. 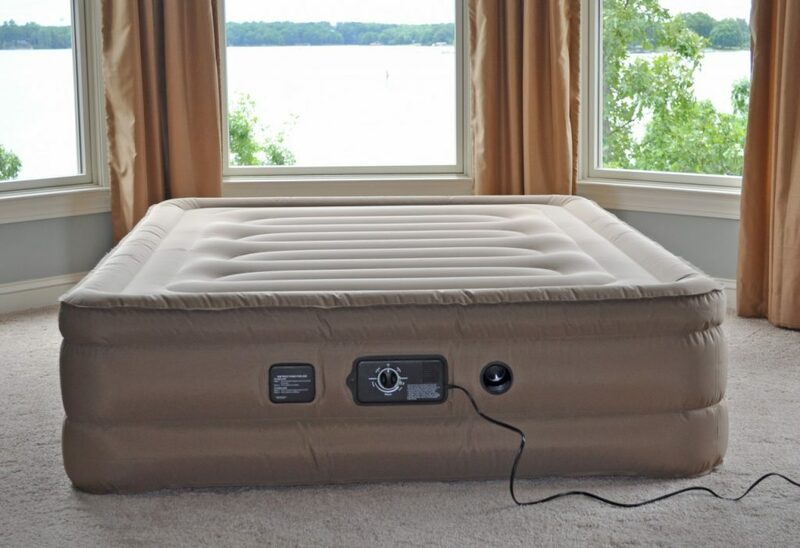 Inflating this air mattress is really easy using the one-click internal pump. It actually fills the mattress to the ideal firmness in under four minutes. 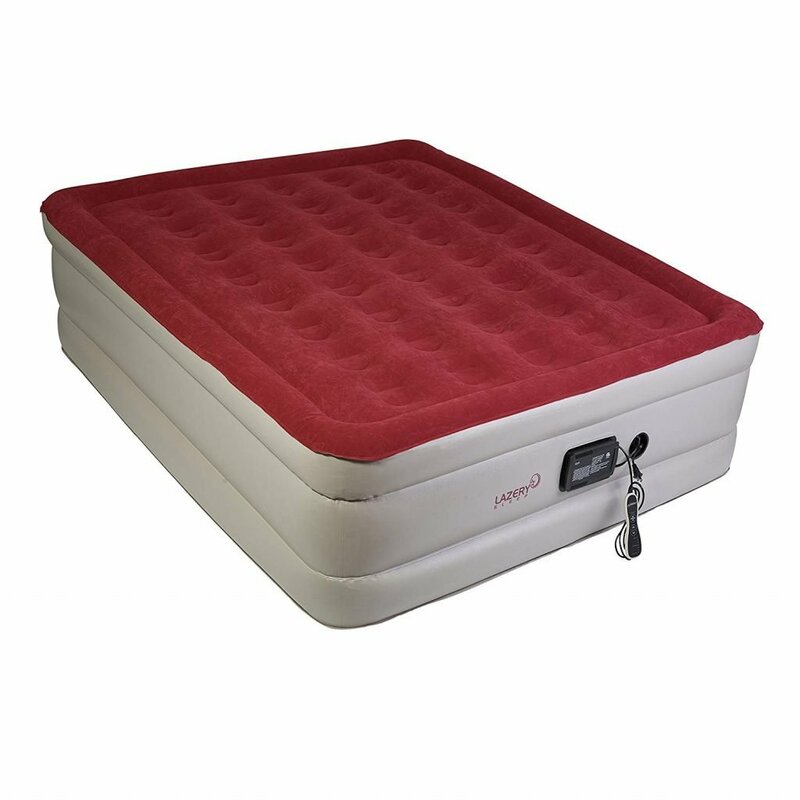 If you like a firmer sleeping surface, you can use the pump for a quick top off. 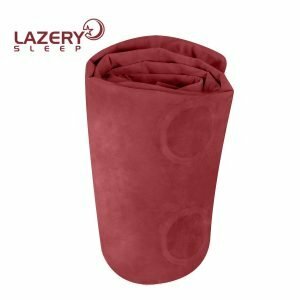 It’s perfect for keeping overnight guests comfortable, stays inflated for days, and deflates just as easily when your guests head home. 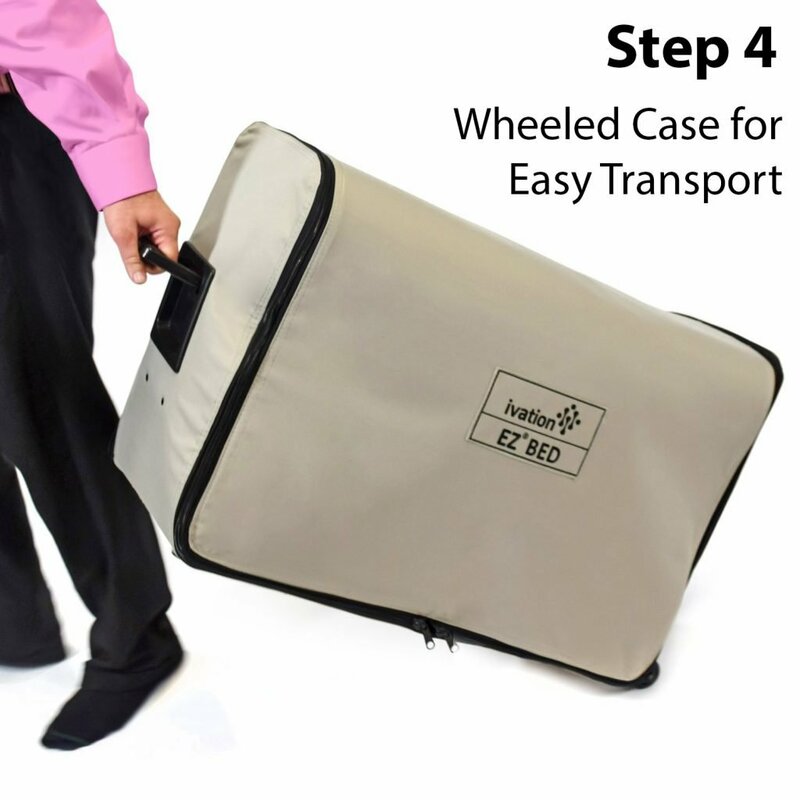 There’s even a carry bag for easy transport and safe storage. Although this mattress is covered by a one-year warranty, it only covers intended use. Note that this mattress is meant for indoor use only and is not recommended for the outdoors. It’s also not designed to be used daily as an alternative to a traditional mattress. Improper use will void the warranty so it’s important to know those things beforehand. When inflated, this mattress is closer to a full-sized mattress than a queen and the rim around the edge makes it feel a bit narrow. While it can comfortably accommodate two adults, plus-sized or tall individuals might need the king size. 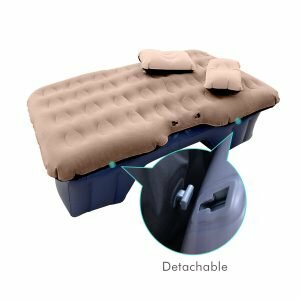 The HIRALIY Car Inflatable Mattress is a must for car camping and comes in useful on long road trips when you don’t want to pay for a hotel. 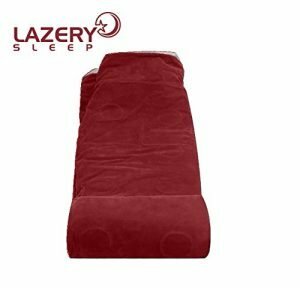 It’s quick and easy to set up so you can pull off the road and be sound asleep in your backseat in no time. This mattress is versatile enough to be used indoors, outdoors, or even as an air couch and comes with a convenient carry bag for easy transport. The comfortable soft flocked top, extra thick waterproof oxford material, and honeycomb pattern add stability and are durable enough to tolerate hard surfaces. To prevent leaks, there’s an air inlet, black bung, and a leak-proof cap, although it may need to be topped off a bit after a day or so. Some users commented that it didn’t stay inflated very long and wasn’t as effective after several uses but this wasn’t common. 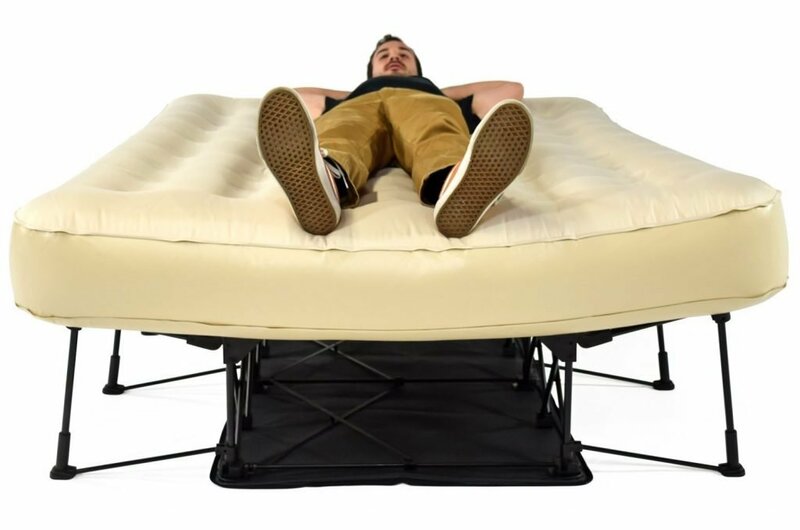 It comes with a portable electric car pump that inflates and deflates the mattress in just about a minute. You also get two small inflatable pillows, a children’s safety baffle, a repair kit, and a car mat. This car mattress is designed for most standard sized cars and SUVs. It’s actually compatible with 95% of car models but you should measure your backseat just in case. Don’t worry about using it outside or getting it messy during a road trip. Cleanup is easy, all you have to do is wipe it clean with a damp cloth. 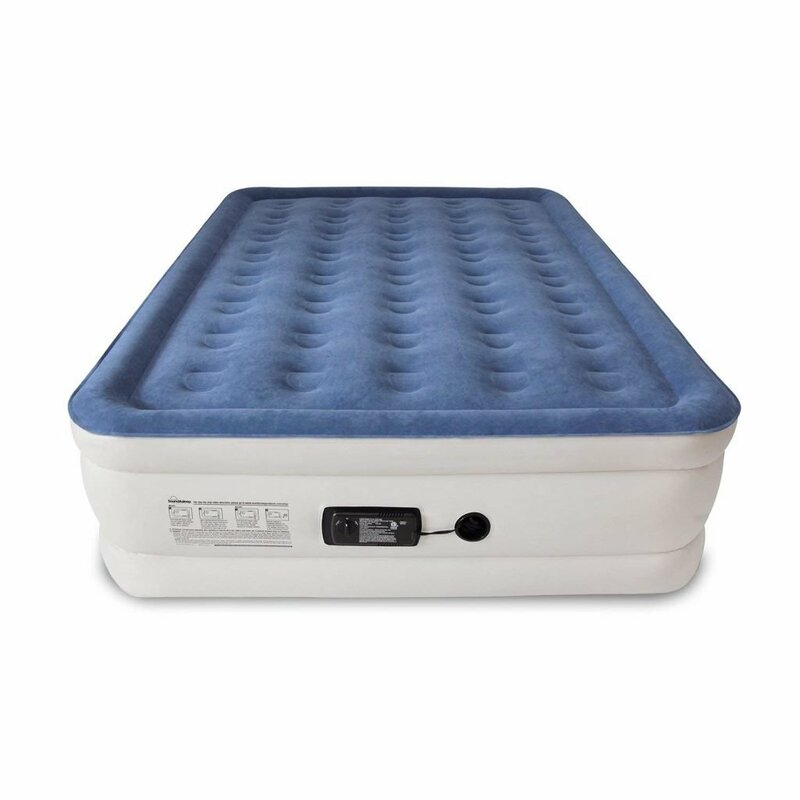 The Ivation EZ-Bed Air Mattress with Frame & Rolling Case is a truly one-of-a-kind air mattress. When deflated, it’s folded into a convenient duffle bag with wheels and is about the size of a large suitcase. Setup is really easy. 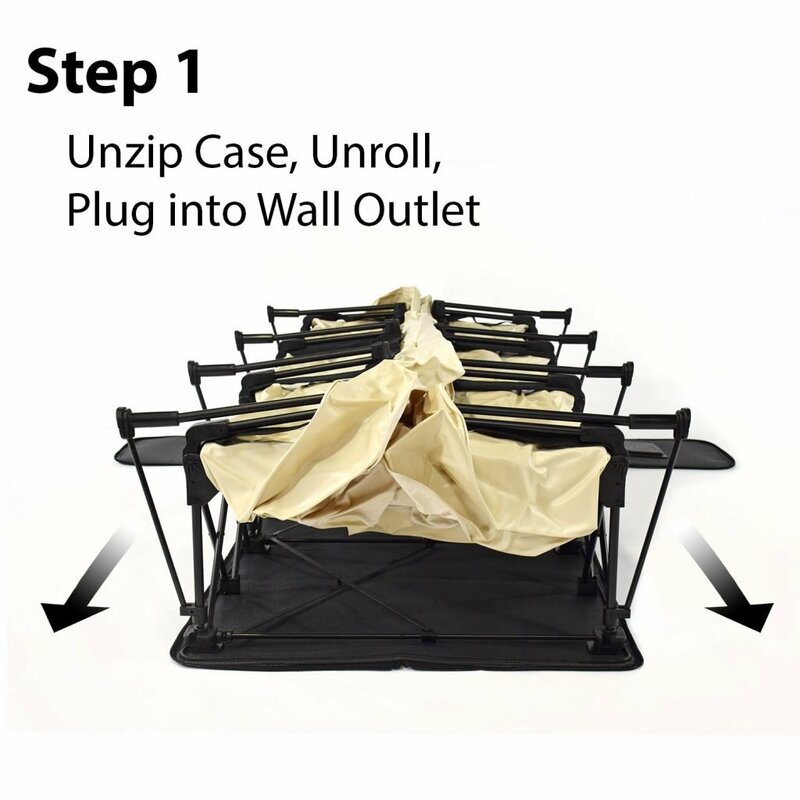 Just unzip the bag, plug it into the wall, turn it on, and it automatically sets itself up using the self-deploying frame. 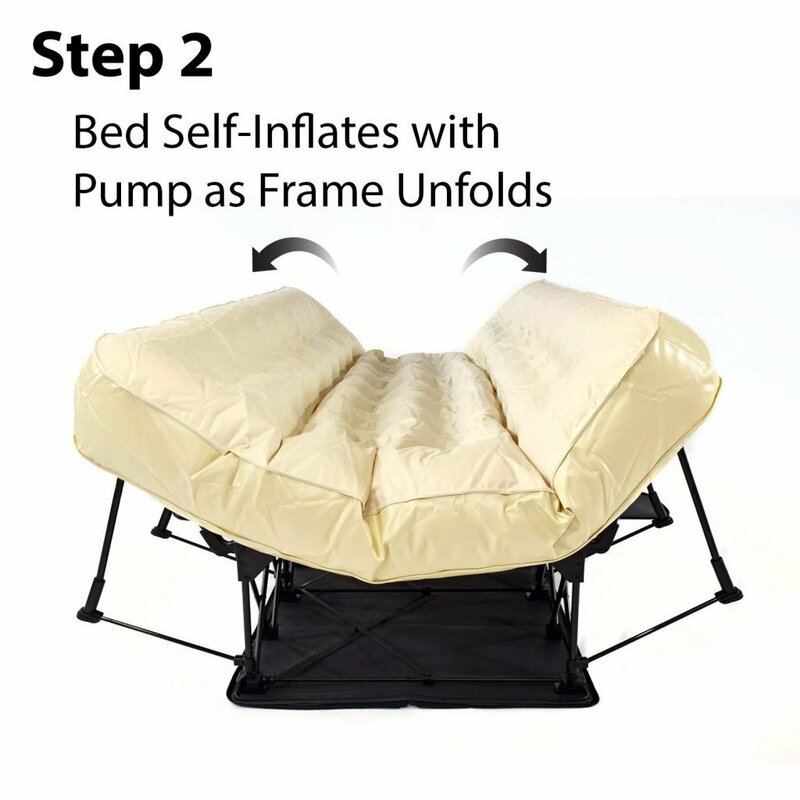 The automatic pump inflates the bed in under four minutes. Once fully inflated, it’s about the same height as a standard bed which makes it much easier for older guests to get in and out of. It deflates quickly and it is designed to easily fit back in the bag for storage, although this doesn’t always work as intended and can be a little tricky. Packing it up and putting it in storage after every use can be a bit cumbersome, since it is a little heavy at 48.9 pounds deflated. This mattress is really comfortable and a lot of users claim it feels like a real mattress. There are 48 circular coils and it benefits from the stability and support of the durable PVC frame. It even gives you the option to choose between a plush, medium, and firm sleeping surface. The flocked top is soft to the touch and helps hold bedding in place. Technically, this bed is large enough to accommodate two people, but some users reported that the mattress wasn’t quite supportive enough. Each person tends to roll toward the center. Ultimately, it’s better suited for a single sleeper. 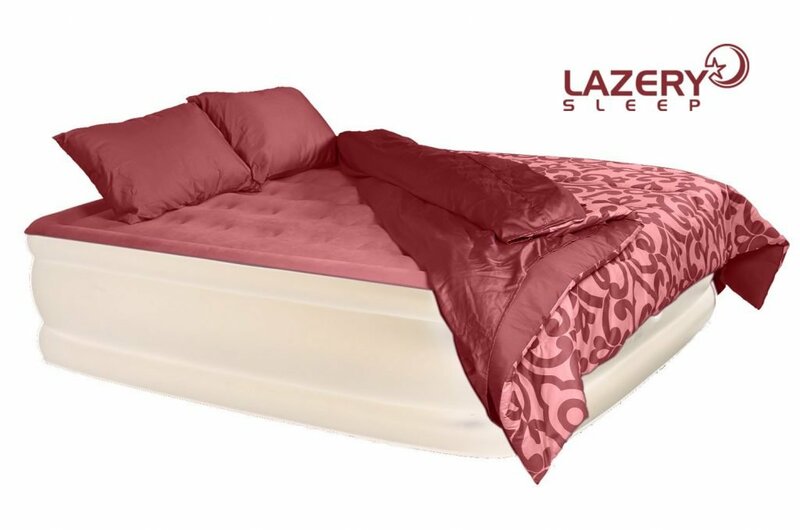 If any quality issues arise, the EZ-Bed is covered by a one year 100% Customer Satisfaction guarantee. 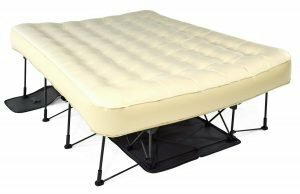 Next up is the Coleman SupportRest Plus PillowStop Double-High Airbed. One of the best things about this one is the double-high height which makes getting in and out of bed a little easier. It comes with a convenient carry bag so it’s really easy to get it where you need it and back. This is our pick for the best queen air mattress for camping. The sleep surface features an antimicrobial finish that resists odor, mold, mildew, and fungus so it’s protected against some of the common things that can happen when sleeping outdoors. Just remember that if you don’t have a power source out there, you’ll need to get a separate battery-powered pump for the mattress. It’s really comfortable, too. The plush surface has a soft velvet-like feel and it fits most standard queen-sized sheets although it’s slightly smaller than a standard queen. 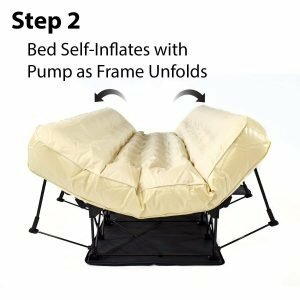 There’s also a PillowStop raised head that keeps your pillow in place while you sleep as well as durable Support Lock reinforced construction to make sure your bed stays stable overnight. 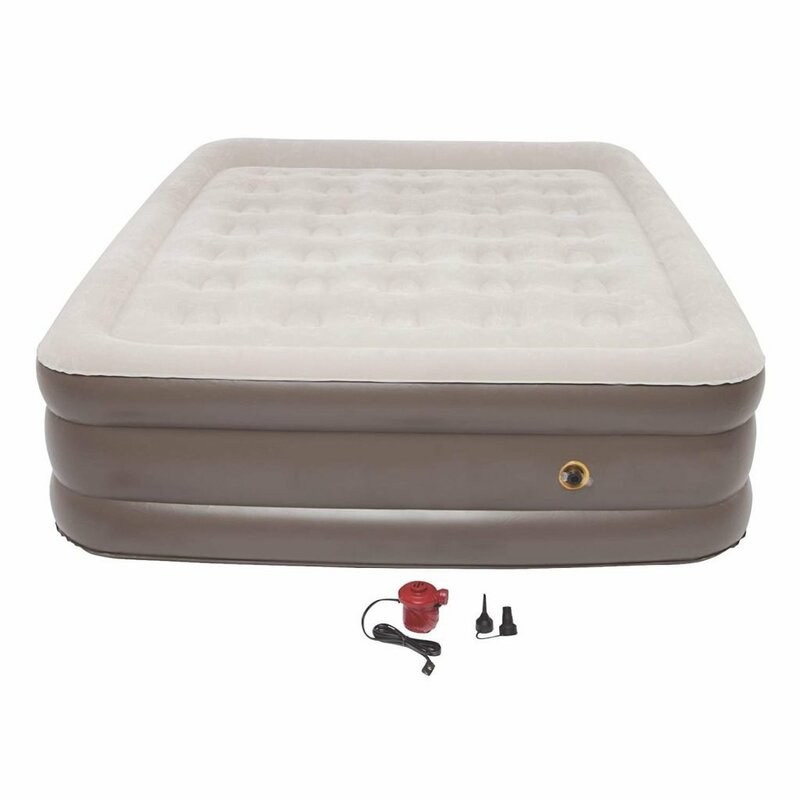 There’s a convenient built-in pump that rapidly inflates and deflates the mattress to your liking. 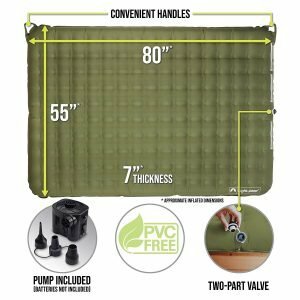 To make sure it doesn’t inflate overnight, it has a Double Lock valve that’s dual sealed, and it’s actually factory tested to make sure it’s leak-free. Technically, this mattress is large enough for two people, but some users complained that it’s difficult to sleep with a partner without someone rolling off. 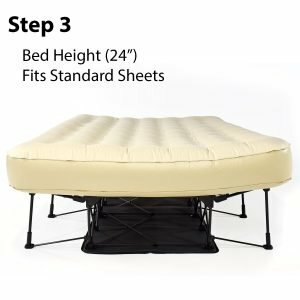 That said, it can hold up to 600 pounds so this is a really good choice for people who are overweight and maintains stability for a single sleeper lying in the center. 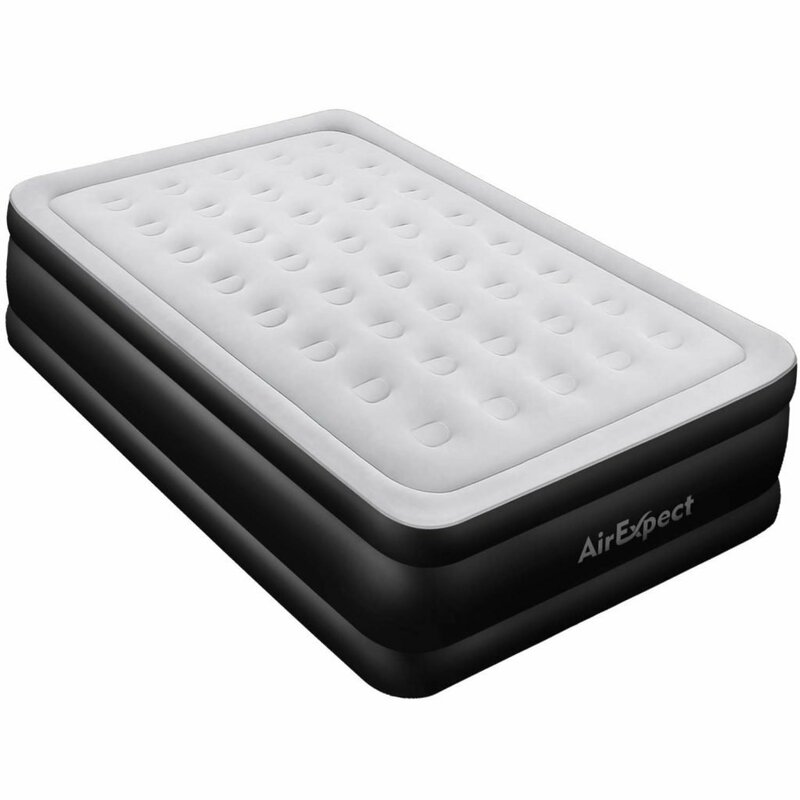 Another great option is the AirExpect Upgraded Inflatable Mattress. 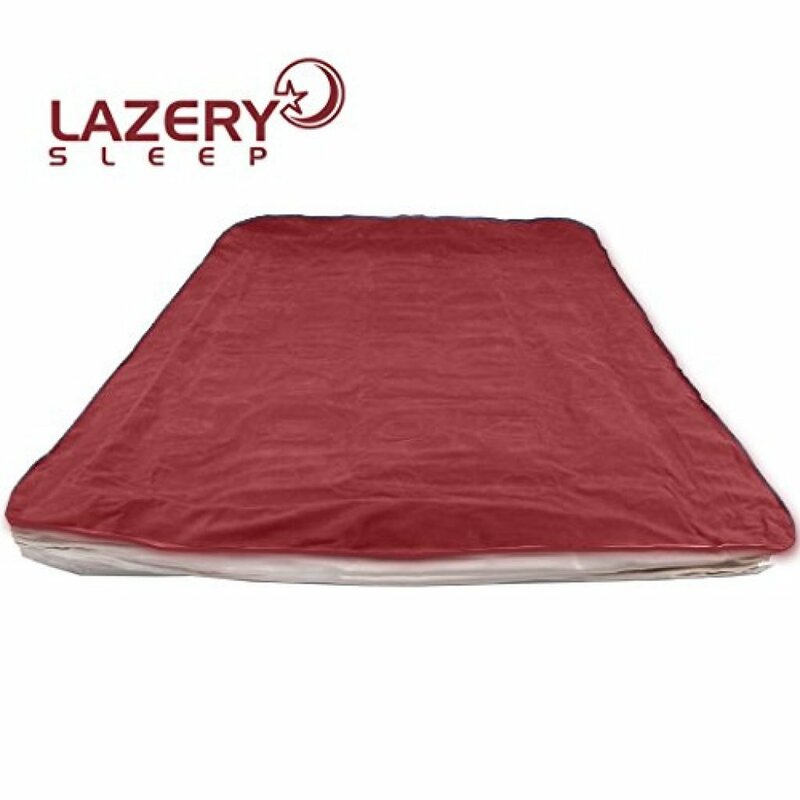 It features a waterproof sueded top that stays dry and keeps sheets and bedding in place for a refreshing sleeping experience. 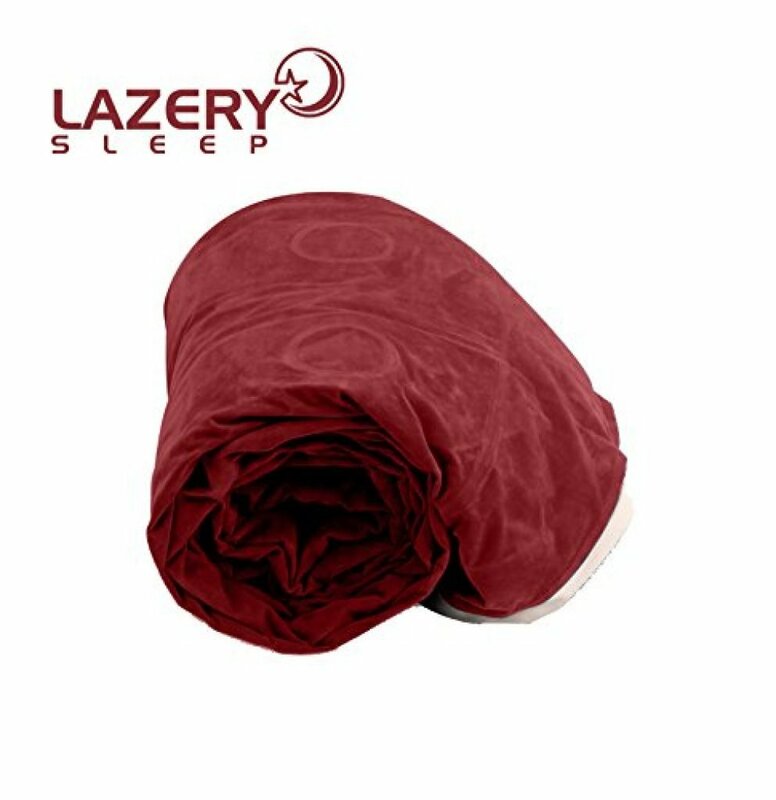 The sleeping surface is extra thick, eco-friendly, and non-toxic so you can rest easy and feel comfortable letting your kids sleep on it. This mattress is really comfortable thanks to the enhanced DureCoil design. There are 40 internal coils for superior comfort as well as extra spinal support to help you completely relax. A skid-proof bottom keeps the bed in place when getting in and out, and the material is durable and resistant to punctures and leaks. Some users commented that it stayed inflated for days without needing to be topped off, though others complained that it leaked at the seams pretty quickly. A built-in electric pump quickly inflates the mattress to the desired firmness in about five minutes, and there’s a built-in compartment to tuck away the power cord to keep the area clutter-free. It also comes with a handy storage bag so it’s easy to transport and store. This mattress comes with a two-year warranty, and you can get a full refund within 30 days if you’re not satisfied. But it’s important to point out that this mattress is not meant for daily use because the material will wear very quickly. There’s 24-hour professional service available if you have any trouble, and they include a repair kit with six self-adhesive patches just in case. The Lazery Sleep Air Mattress provides the comfort and support of a traditional mattress with the portability and convenience of an air mattress. A thick waterproof top, puncture-proof material, and gripped bottom provide a lot of durability. This mattress is comfortable, too, thanks to a dual chamber design and 40 air coils. 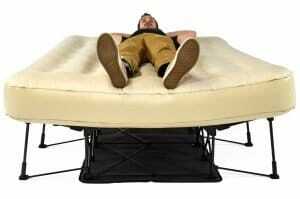 It holds up to 500 pounds and is large enough to comfortably sleep two people, although some users reported that it tended to sag in the middle a bit when used by two adults. 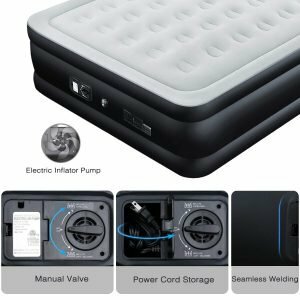 A built-in electric pump inflates the mattress in less than four minutes and operates 20% quieter than comparable pumps. It uses an efficient internal inflator with LED remote that gives you seven different settings to choose from, ranging from soft plush to extra firm. You can also customize the feel at the push of a button. It comes with an automatic shut-off for safety and convenience, although one complaint is that there’s no manual valve for deflation. That means you actually have to connect the pump to power in order to put the mattress away. That said, once it is deflated, it’s easy to get back into the carrying bag for storage. Some users reported leaks after minimal use and felt the mattress didn’t last as long as it should have, although it should be noted that it’s not designed for everyday use. Using it every day quickly degrades the material. Lazery offers a 100% one-year satisfaction warranty and their customer service seems to be very responsive. Next up is the Etekcity Comfort Air Mattress which has the stability and comfort of a real bed. It features unique veins over the sleeping surface to support your whole body to help you get a solid night’s sleep. Setup is really easy. 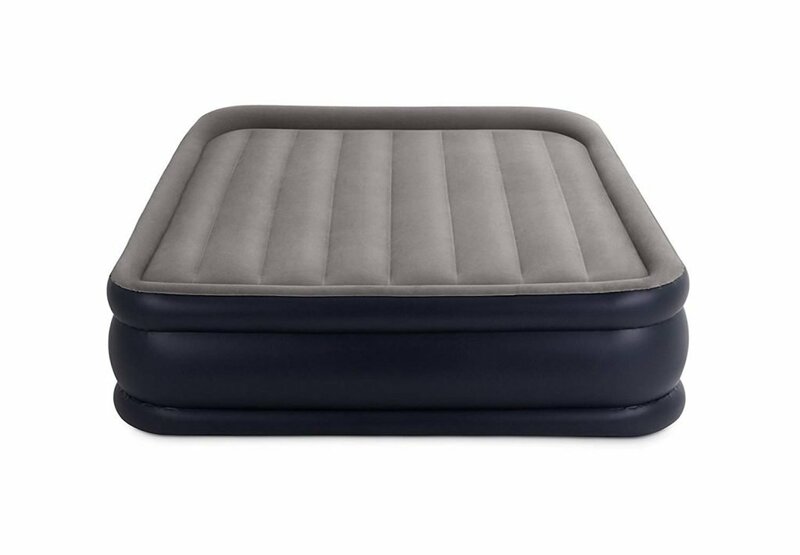 The built-in pump quickly inflates the airbed to desired firmness in as little as three minutes, and the power cable can be easily stowed away in a built-in storage compartment to keep your room clutter-free. Superior welding keeps it air-tight, and the unique edge design provides extra support so you don’t have to worry about falling out of bed. 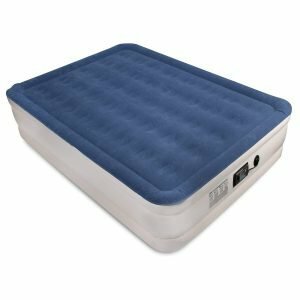 While a lot of air mattresses don’t provide the right level of support for two people, most users who tried this one commented that it was comfortable and supportive enough for sharing. This is also a good choice for camping. It doesn’t come with a manual pump, but it is compatible with one so you don’t have to worry about having access to electricity to set it up. 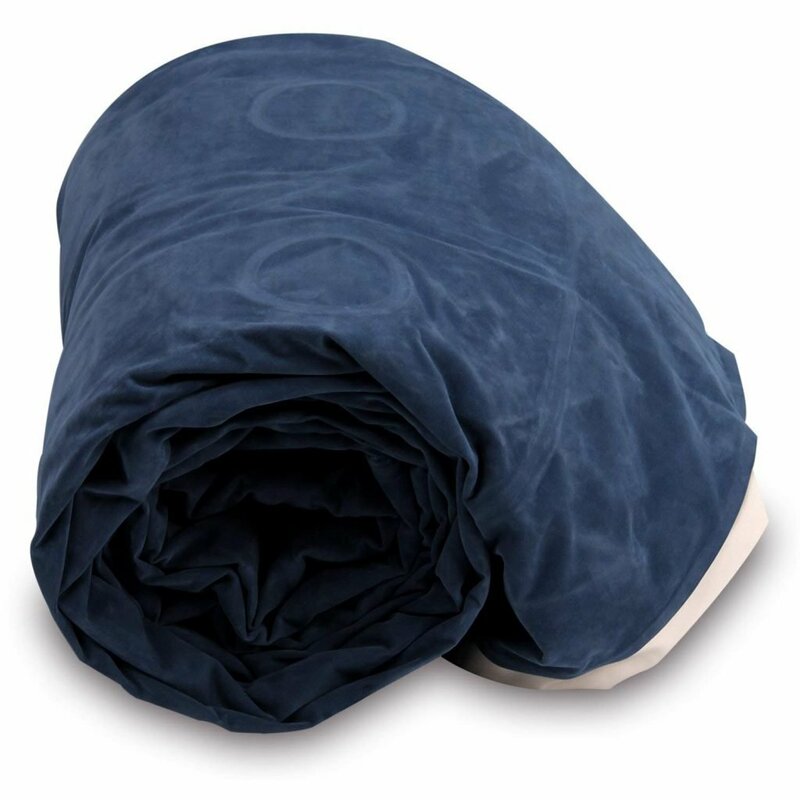 It has a waterproof flocked top that’s really comfortable and easy to clean, just wipe it down with a damp cloth. That’s not all, there’s also an extra-thick eco-friendly PVC underside that provides protection against hard surfaces and prevents any unwanted sliding. Some users reported significant leaks with this product and even stated that it needed to be re-inflated after every use, although most people were satisfied. Etakcity does offer a two-year warranty with this mattress as well as lifetime technical support. The company is very responsive and provides excellent customer service. 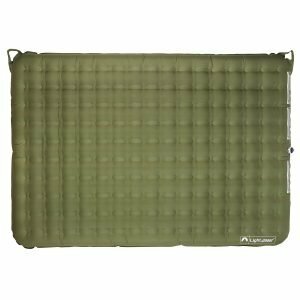 The Lightspeed Outdoors 2-Person Air Bed Mattress is without a doubt the best self-inflating air mattress for backpacking. It’s lightweight, comfortable, and has a battery operated pump so it inflates anywhere. A two-way valve allows you to adjust firmness from soft to firm, and a built-in stabilizer system supports your weight all night long. The unique design uses independent connectors between the top and bottom layers to distribute weight evenly. This helps minimize bouncing and motion transfer between partners. One thing that’s not ideal is the pump. It works great, but you do have to supply batteries, and it runs through them pretty quickly. You also have to make sure that the connection between the pump and the valve is just so for it to inflate effectively. That means you can’t turn on the pump and walk away while it self-inflates. It takes under five minutes to inflate completely, though, so it’s not eating up too much time. The durable TPU construction is abrasion resistant, temperature stable, and less prone to stretching. When deflated, it rolls up easily and tucks into the convenient carry bag, and since it only weighs six pounds, it’s easy to carry around attached to your pack. Some customers reported that it didn’t hold air and deflated overnight with the first use, though this wasn’t the typical experience. Keep in mind that this mattress is covered by a one-year warranty that should cover any defects. The Intex Dura-Beam Standard Series is the best cheap air mattress in our reviews. It’s budget-friendly, comfortable, and easy to use. This mattress has a built-in high-powered electric pump that inflates the mattress in just about three minutes. Simply adjust the dial to get the right level of firmness. You can also quickly add more air as you need it to top it off after use. The fiber-tech construction is extremely durable and the top is covered with soft flocking for a really comfortable sleeping surface. Also, there are indented sides that help keep a fitted sheet in place. That’s not all; the outside perimeter provides structure and support while you sleep and helps prevent you from rolling out of the bed. It even acts as a built-in pillow! Inside, the special vertical beam construction adds more stability to give you a comfortable night’s sleep. A duffel bag is included, which makes it easy to toss in the car for a trip to see family or tuck away in a closet until your next guests arrive. There are user complaints about this mattress leaking or coming apart at the seams after only a few uses, though this was not the typical experience. In fact, a lot of people were very impressed because they didn’t need to top off this mattress as often as others. Air mattresses typically aren’t designed to replace a real bed, and overuse can lead to problems with leaking. It’s covered by a 90-day warranty so it’s a good idea to open it and check it out right away so you can return it if necessary. There are a lot of things to consider when buying an air mattress. Whether you’re looking for the best air mattress with built-in pump or something less specific like the best twin air mattress, here’s how to make sure you’re getting the right one for you. Who might need an air mattress? The truth is there will come a time when most people will wish they had an air mattress. Maybe you’re camping and your bedroll just isn’t cutting it or you’re having guests for the weekend and you don’t want to have to give up your own bed to accommodate them. An air mattress is one of those products that you don’t really realize how useful it is until you have one. Then, you’ll wonder how you ever got along without it. The main thing to keep in mind while you shop is how you’re planning to use your air mattress. Something you’re planning to use in a spare room when guests are staying the night might not be suitable for camping or backpacking and vice versa. Here are some of the major things to keep in mind to choose the right air mattress for your needs. There are two different types of mattresses, single-height and double-height. Single-height mattresses are usually between nine and 11 inches high while double height mattresses range anywhere from 17 to 21 inches. Thicker mattresses tend to be a little more comfortable because they provide more cushioning while single height mattresses are usually lighter and easier to transport. Another thing to look into is whether or not the mattress is made for outdoor use. 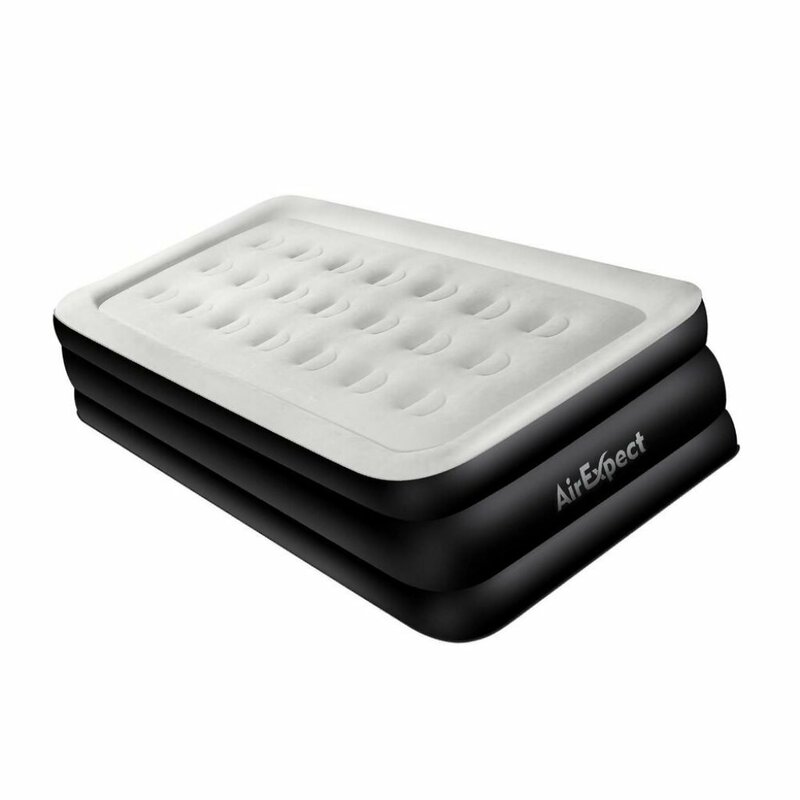 For example, our top pick, the SoundAsleep Dream Series Air Mattress, is for indoor use only. While some people might ignore this recommendation, using an indoor mattress outdoors will cause it to wear quickly and most likely voids the warranty. 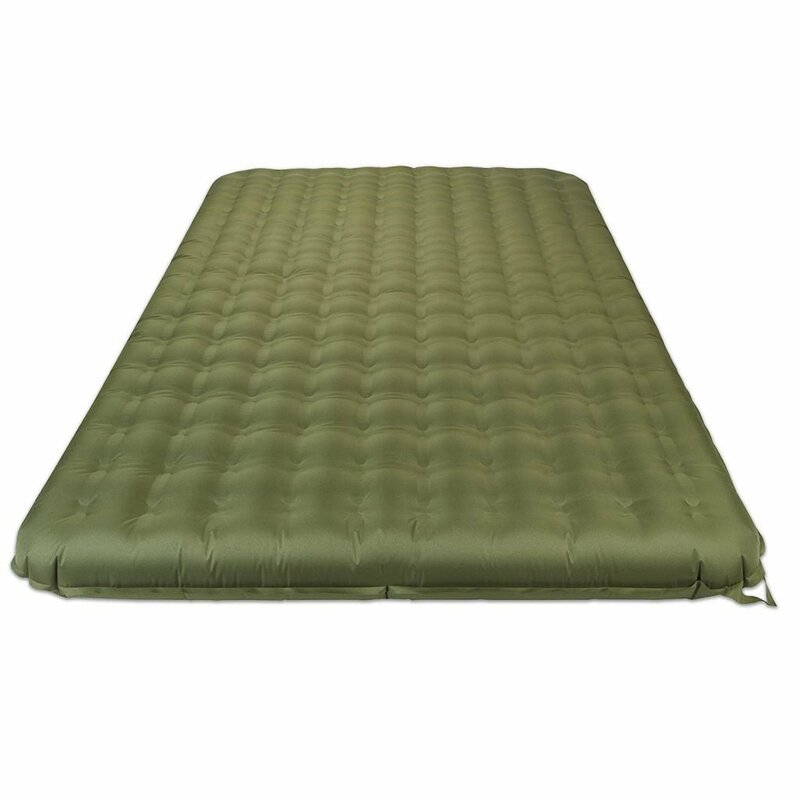 If you’re looking for an outdoor mattress, choose one like the Coleman SupportRest Plus PillowStop Double-High Airbed. It’s made of extremely durable material and even resists odor, mold, mildew, and fungus, perfect protection against exposure to the elements. If you’re looking for the best air mattress, you should take a careful look at the pump, as there are a few things to consider. How quickly can the pump inflate the mattress? Does it have an automatic shut-off so you can walk away while it inflates or do you have to monitor the progress yourself? How is it powered? Do you need access to an electrical outlet or a supply of batteries? One of the best features available with a pump is the ability to choose the firmness of the mattress. The Lazery Sleep Air Mattress is a great example of this. The corded remote control has seven different options ranging from soft plush to extra firm. 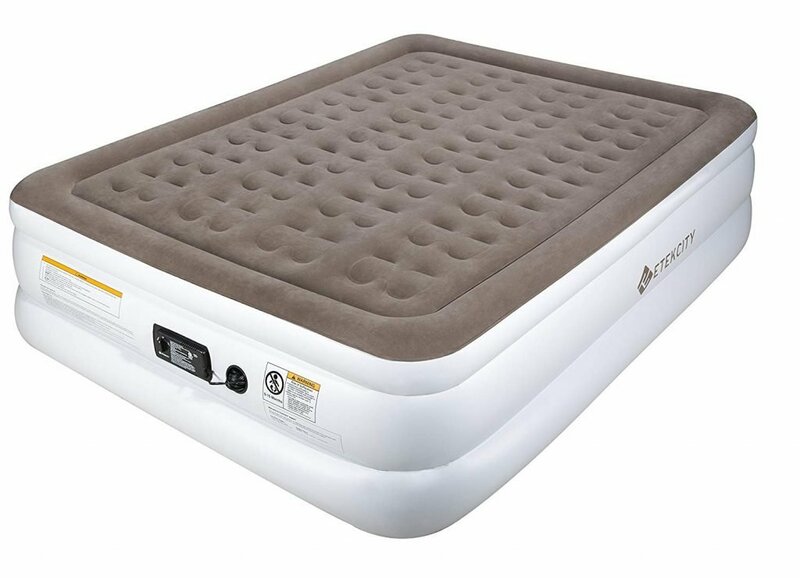 This isn’t a necessity to finding a good air mattress, but it sure makes for a better night’s sleep. 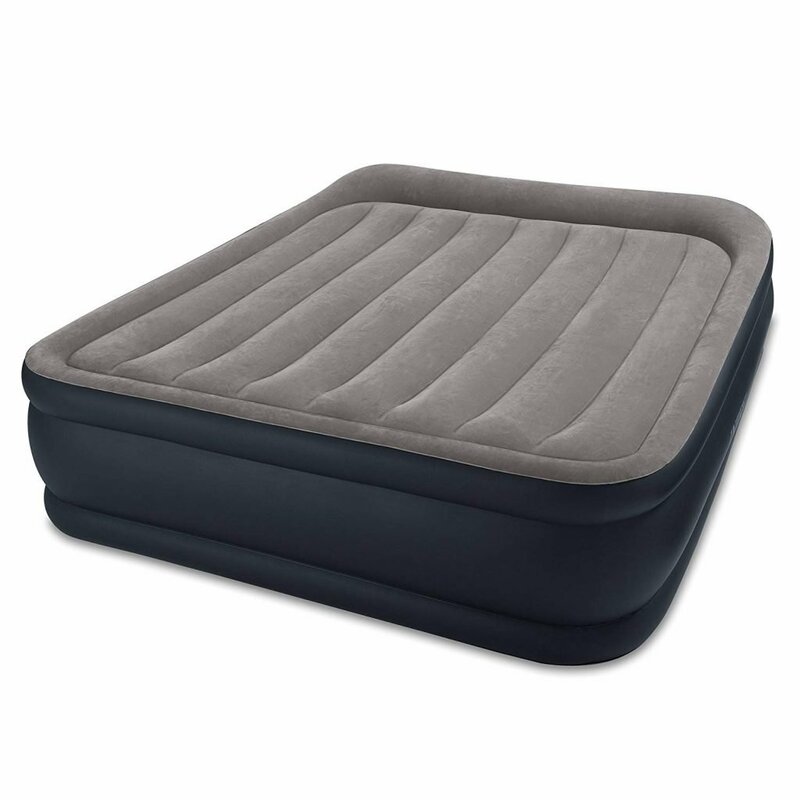 Weight and portability are particularly important for an air mattress that’s meant to be used outdoors. It’s not as easy getting your air mattress to a campsite as it is to move it from the storage closer to the guest room. 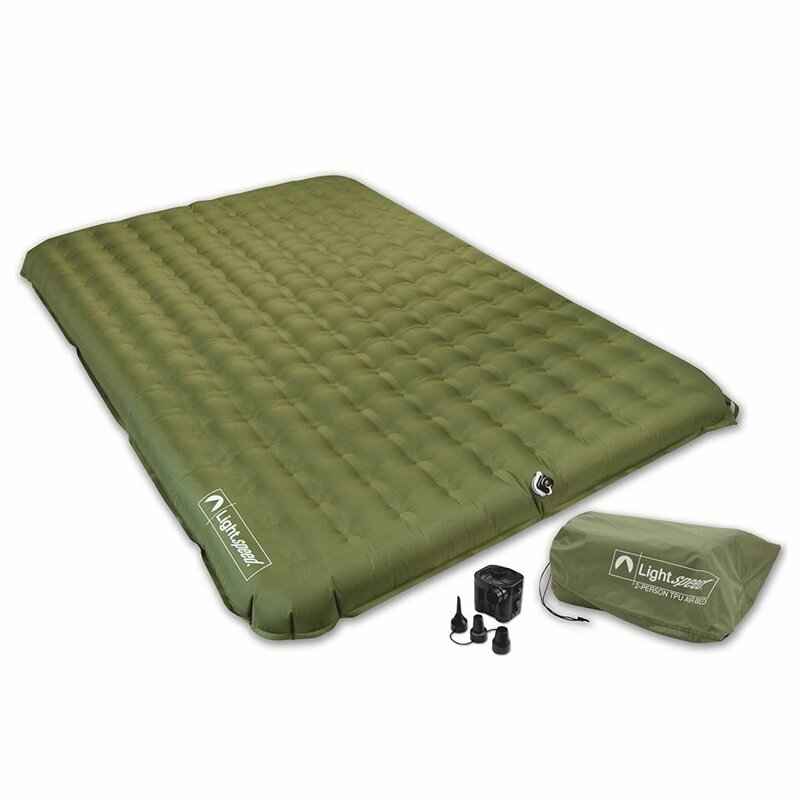 The Lightspeed Outdoors Air Bed Mattress is a great example of an air mattress suited for camping and backpacking. It weighs only six pounds and is pretty easy to carry with you even on longer journeys. Air mattresses can hold anywhere from 300 to 650 pounds. 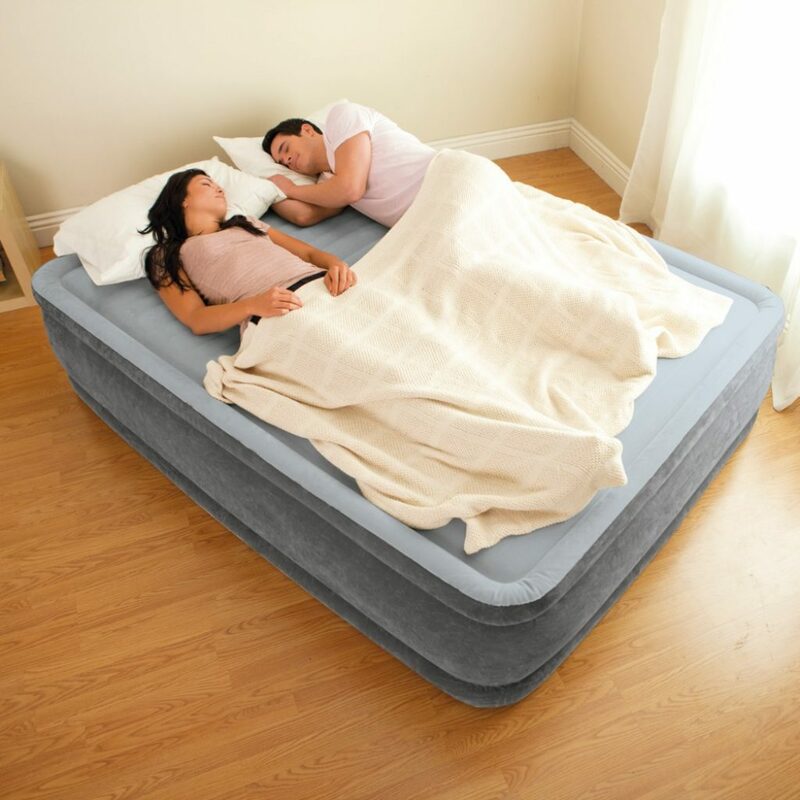 If you’re planning to use an air mattress for two people, make sure you get one that can hold their combined weight. Sticking to the weight capacity is really important. Piling on more weight that the mattress can handle puts a lot of stress on the joints, stitches, and internal supports which will definitely cause damage and shorten the overall lifespan of the mattress. Plus, if any damage is shown to be from misuse, it could void the warranty. There are a few different design factors to consider. Most outdoor air mattresses have a really durable bottom that resists abrasions from the hard ground, rocks, and twigs you encounter when you sleep in the great outdoors. If you’re worried about whether or not the sleeping surface is comfortable, look for a design with a flocked top that’s soft and smooth or one with a lip that helps hold a sheet in place. Another thing to consider is something we mentioned earlier, the ability to choose how firm the mattress is. This comes in really handy if you have a strong preference for how firm your mattress is because you can choose to make it as soft or firm as possible. Whether you want a twin or the best queen air mattress available, you’re in luck. Although queen-sized tend to be the most popular, most of these mattresses are available in a range of sizes to accommodate you and all the members of your family. All of these mattresses are made of strong, durable material. Some, like the AirExpect Upgraded Inflatable Mattress, are resistant to punctures and can be easily fixed in the event something does happen. The warranties of these air mattresses vary a little but there are two main things to keep in mind. One, the warranty won’t apply if you misuse the product. As we’ve mentioned, that means not exceeding the weight limit and using the mattress only in the recommended environment. An issue that a lot of users had in general is waiting to open the mattress until they needed it and discovering that there was some flaw or defect that they weren’t aware of. This usually put them outside the warranty period and left them stuck with a faulty mattress. An easy way to avoid this is to open the mattress and inflate it immediately. Sleep on it a night or two, top it off with more air if needed, and see what you think. If something isn’t working, at least you found out early enough to take advantage of the warranty. In addition to inspecting your air mattress right away, here are some things you can do to take care of your air mattress. Inflate to the proper capacity. A lot of these pumps do this automatically but also give you the option to top off the mattress when necessary. Be careful as too much air can put a lot of stress on the seams. Use bedding. Even if your mattress has a comfortably sleeping surface, using a sheet is a good idea. It protects the mattress from dust and debris and as well as night time sweat. Clean it regularly, ideally before and after every use. Wiping it down with a solution of dish soap and water will do the job. Clean when it’s inflated, towel dry, and let it air out for a bit before using it or putting it away. Store it properly. It can be a bit of a hassle to get these mattresses back into their storage bags but that’s really the best way to make sure it doesn’t get damaged between uses. Remember that a little bit of deflation is normal. When you first use your air mattress, the material will stretch a bit so you’ll need to add more air. This doesn’t mean that it’s leaking, just that you’re breaking it in a bit. You won’t be surprised to hear that prices vary a lot. They’re usually related to the quality of the materials used to make the mattress as well as its size. 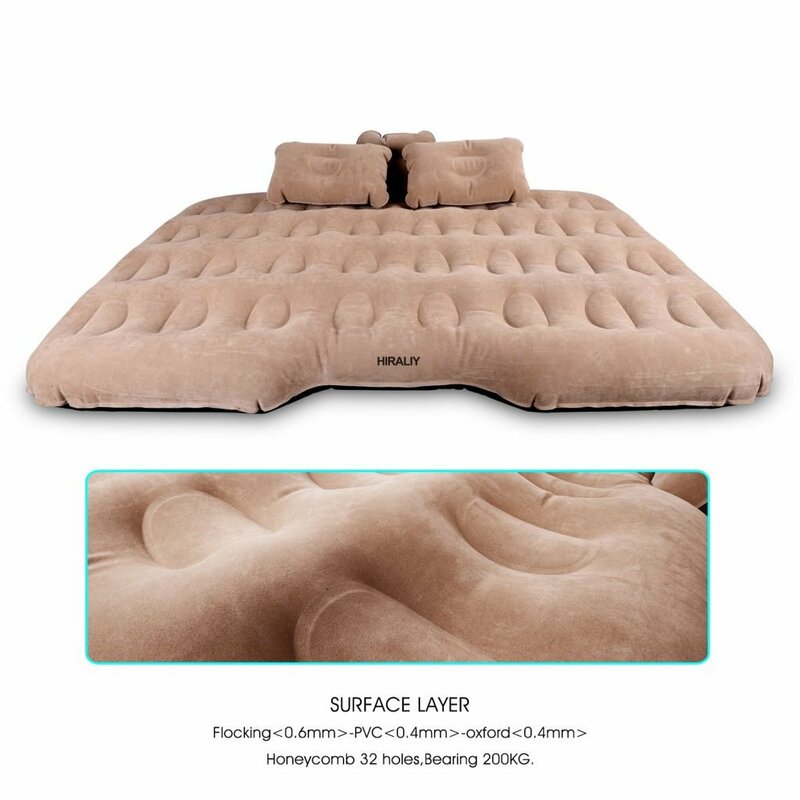 Typically, higher priced items have more features including adjustable firmness, a frame, extra pillows or accessories, or internal coils for additional support and comfort. The less expensive options are comfortable but may not last quite as long as those of high-quality. My air mattress started to leak. Can I repair it? You can repair a leaky mattress. The first thing to do is determine whether or not it’s actually leaking. 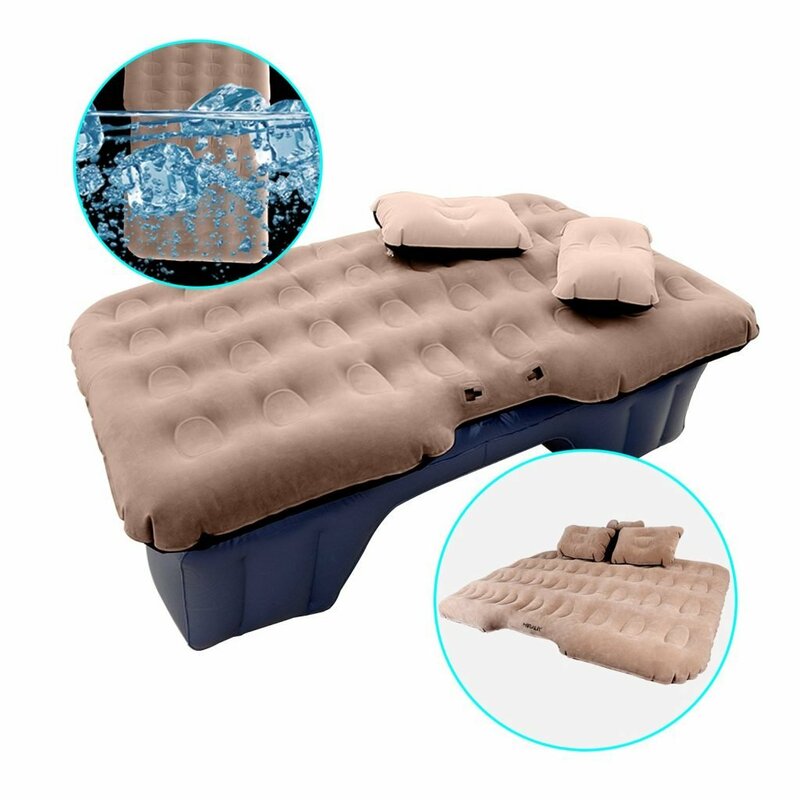 It’s normal for an air mattress to deflate a bit over time but if you’ve located a leak, that’s a much different story. After locating the leak, deflate the mattress completely. Use superfine grit sandpaper to rub away the fibers surrounding the leak. Make sure the area is completely dry then apply the patch. Hold your palm over the patch for a minute or so to make sure it’s adhering from edge to edge. Let it sit for a few hours to allow the adhesive to cure before re-inflating. Can I use an air mattress instead of a real bed? You shouldn’t. Even the best air mattress for everyday use isn’t designed to replace a real bed. Not only will they wear very quickly if used every night, it will also void the warranty. I’d like to get an air mattress for camping. What should I be looking for? The first thing to do is make sure the mattress you’re looking at is made for the outdoors. These mattresses are usually made of thicker material with a bottom that can tolerate sitting on the ground where it will come in contact with rocks and dirt. Look for one that has some waterproofing and remember that resistance to mold and fungus is always a good thing. 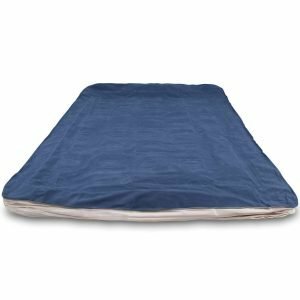 Do I need to buy special sheets and a mattress pad to go with an air mattress? 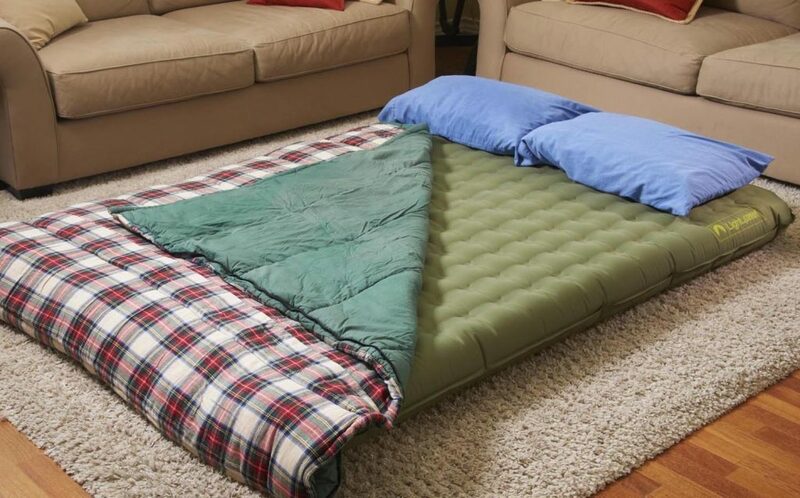 You should always put a sheet on your air mattress but you don’t need to buy anything special. Standard sheets should work just fine. 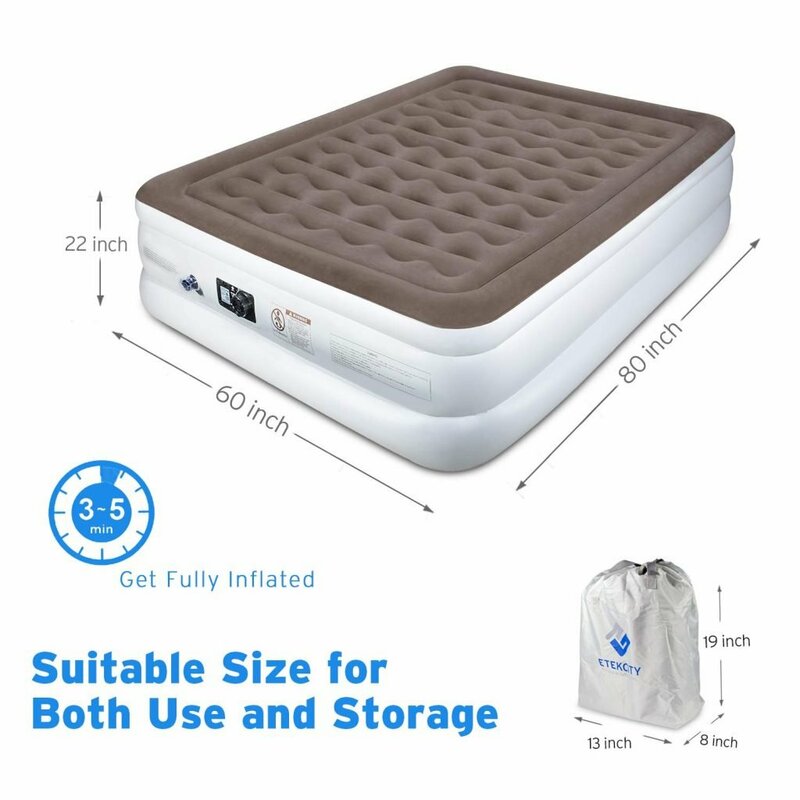 As for a mattress pad, you don’t necessarily need one because most air beds are designed to be comfortable enough on their own but if you have one and it makes you more comfortable, there’s no harm. Just make sure doesn’t void the warranty. Can an air mattress be overinflated? Yes. Overinflating adds a lot of tension to the seams and construction of an air mattress so it’s really important to make sure you’re using the right amount of air. Most pumps automatically inflate the mattress properly but be careful when topping it off or using a manual pump. 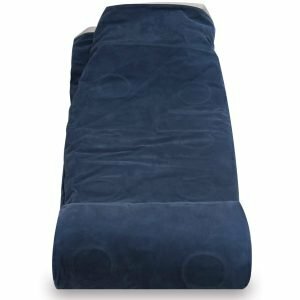 Our top pick is the SoundAsleep Dream Series Air Mattress, a comfortable and durable option and the best air mattress for long term use. The Sure-Grip bottom prevents sliding and there are 40 internal air coils for superior support. It sleeps two people comfortably and fills in less than four minutes. 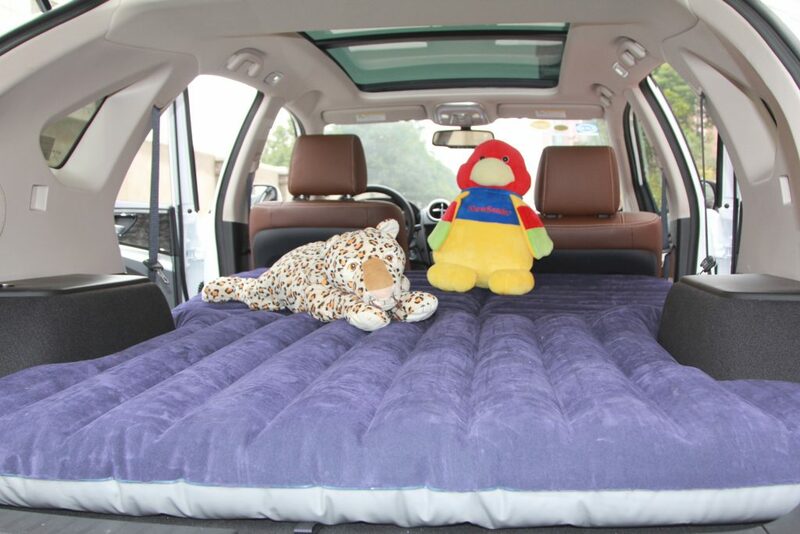 Next is the HIRALIY Car Inflatable Mattress, the best rated air mattress for car camping and road trips. It’s compatible with 95% of cars and is versatile enough to use indoors and outdoors and it comes with two inflatable pillows, a repair kit, and a portable pump. 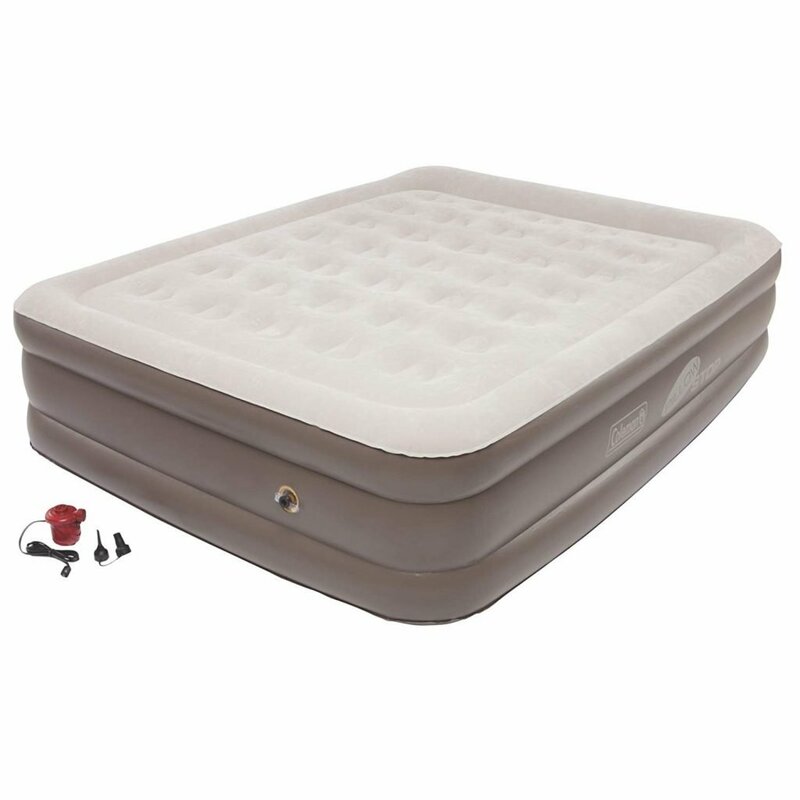 Finally, we recommend the Ivation EZ-Bed Air Mattress with Frame & Rolling Case. This mattress includes a self-deploying frame for support and when completely inflated is just about the same height as a regular bed. There are 48 internal coils and a soft flocked top for added stability and comfort.